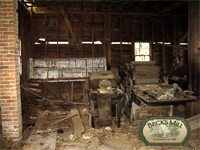 Welcome to Historic Beck's Mill! 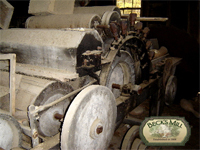 After setting idle for more than 50 years the little grist mill south of Salem, Indiana is now churning out a product that once made it famous. 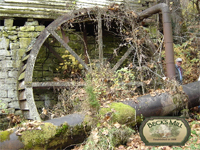 The Old Mill sat idle and was a sad reminder to the lifestyle of our pioneering ancestors. 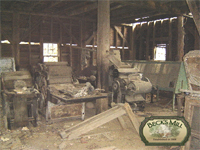 The mill's mechanical and structural elements were deteriorating. 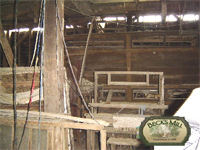 Rodents chewed away at the huge timbers of the main frame structure while floor boards rotted away from moisture damage. The mill structure was unsafe to enter and unfortunately with such a unique historic structure sitting empty vandals pilfered some interior furnishings and equipment. Then came hope for the future. 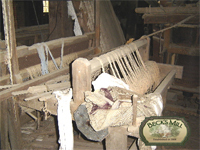 In 2005 a group participating in the Awareness Washington County (AWC), a Washington County leadership development program, decided to explore the possibility of restoring the Mill. 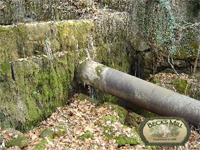 As a tribute to the determination of the members and their understanding of the importance of saving such a unique landmark their efforts yielded positive results where others had failed during the 50 years prior. 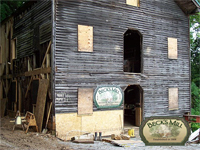 The AWC group coordinated efforts with the current property owners of the mill (several members of the Beck family) to take ownership of the landmark and chart a new course for the restoration and continued preservation of the mill. The leadership of this group established a new direction as a non-profit organization. 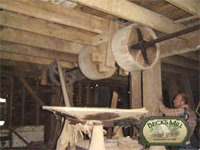 This non-profit organization was established as the Friends of Beck's Mill Inc. and their mission would be to present to the public a working grist mill as an accurate recreation of pioneer life in Washington County, Indiana. For the first time in more than 50 years the future of the mill begin to turn around. 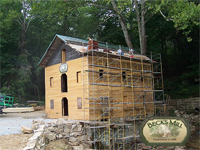 While the determination of the volunteers of the newly formed Friends of Beck's Mill Inc. was evident their ability to locate funding to complete such a large restoration project was uncertain. 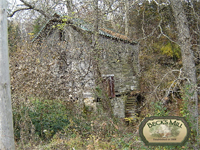 Bill and Gayle Cook, along with son Carl realized the historic significance of Beck’s Mill to Washington County after learning about the efforts to save Beck's Mill. Bill and Gayle Cook founded Cook Group in 1963 in Bloomington, Indiana and their philanthropic efforts have touched the lives of Hoosier's all across Indiana. 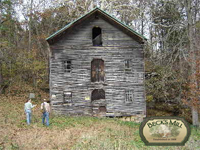 In 2006, the Cook family graciously offered to assist the group in their effort to reclaim the Mill. 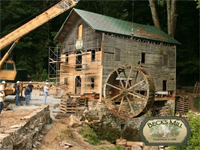 With the efforts of Pritchett Brothers performing the restoration services in partnership with Ridgway Architecture the future of Beck's Mill had finally changed for the better. A bright new future for an Old Mill. 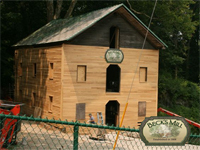 In 2008 Beck's Mill was returned in restored and operational condition to the directors of the Friends of Beck’s Mill, Inc. Beck’s Mill is operated solely by the efforts of an all volunteer staff and the leadership of Friends of Beck’s Mill, Inc. continues to enhance the visitor experience to Beck's Mill every year as numerous new events are planned every season. 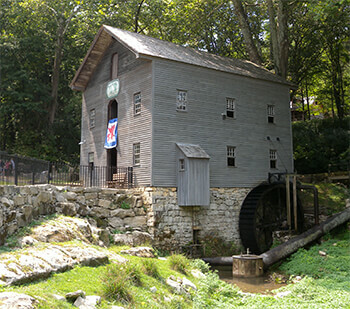 From all of us at Friends of Beck's Mill Inc. we look forward to seeing you at Historic Beck's Mill! 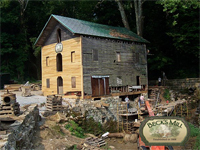 Beck's Mill could be closed for high water/flooding and during days of extreme heat, in this case it might be best to call the mill at Phone#812.883.5147 to verify we will be open. 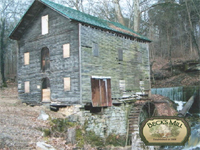 Beck's Mill is managed by the "Friends of Beck's Mill" a Non-Profit Organization that operates the mill with your admission fees, donations and memberships.